Innovation. Flexibility. Passion. BR Printers thrives in the hyper-competitive print industry. For over 26 years we have served the largest publishers and companies with book manufacturing, commercial print, marketing solutions, web portals, distribution, and large format printing. Over twenty five years ago, our company opened as an all-digital print shop. Since then, we've been ahead of the curve on commercial print, book manufacturing, rebinding, custom publishing, and packaging logistics. What gave us the inspiration to innovate like that? The answer is really simple: our customers dictate the problems we solve. Following the entrepreneurial spirit of our founders, in 2018 we introduced BR 3.0. What’s new with BR 3.0 is our focus and expertise in marketing solutions. By acquiring new talent and businesses we now offer our customers large format printing to meet all of your signage needs and full service direct mail, distribution, promo, demand gen and more. At BR we know print is alive and well. We do not offer 20th century products because our customers do not have 20th century needs. In the 21st century production processes that work at the smallest scales for maximum agility and flexibility are needed to keep pace with a customized data driven world. Reports of printing's demise may be exaggerated, but they have it half right: the old model, where a huge printing press runs off innumerable copies of the same product, is no longer relevant to our economy. However, advances in printing means that things only imaginable before, are now possible. BR offers customization and personalization leveraging data and technology in a digital world with appreciation and respect for traditional print craftsmanship. Our commitment is to provide solutions in response to our customer's needs. By emphasizing innovation and utilizing our advanced digital capabilities, we aim to keep printing as relevant as ever. Where other firms fail, we succeed by offering a variety of in-house solutions, flexibility, with world class production and logistics. Please connect with me on LinkedIn or contact me at Adam@brprinters.com I am happy to share more details about our business, our employees, and our products. Founded in 1992 by industry veterans Rich Brown and Chris Rooney, BR Printers set up shop in Silicon Valley to supply solutions for the booming software market. At the forefront of the digital printing age, BR quickly became the printer of choice for Silicon Valley, including primary clients Oracle and Sun MicroSystems, and was well on its way to becoming the largest digital print solution in the Western United States. Over the next two decades, BR rapidly expanded its services, markets, and, therefore, it’s efficiency. With three production facilities across the United States and partners in Puerto Rico, Asia and Europe, BR is able to deliver solutions both across the country and the globe. In fact, product offerings have diversified to include every major printing need, delivered at any scale. BR has such immense capabilities that it is now the favored solution for Fortune 500 tech companies like eBay and PayPal. BR also serves all of the largest textbook publishers and some of the largest healthcare providers in California. Never forgetting its entrepreneurial or tech roots, BR continues to be industry leaders in innovation. In 2005, current President Adam DeMaestri devised a process for updating and reusing older editions of textbooks that significantly reduced the resources used, and therefore the cost, for textbook manufacturers. In 2012, recognizing that customers want a more complete solution than merely printed materials, BR acquired printing logistics firm Agilaire, one of Silicon Valley’s fastest growing companies from 2007 through 2010. 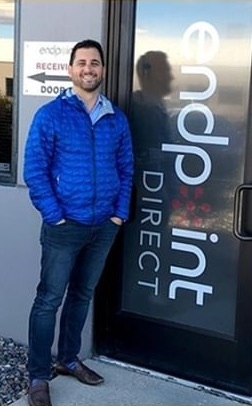 In 2017 BR Printers acquired Banner Express to expand into the large format industry and in 2018 acquired Endpoint Direct to offer direct mail, data and distribution services. Additionally BR Printers as invested in talent and technology to bring a full array of marketing solutions to customers including promo and demand gen.
BR continues to innovate and provide printing solutions that match the dynamism and complexity of the 21st century.